We can see how easily the seeds get planted. The ducks will be back as soon as I go indoors. Below, the tiny faint dots all over the background are midges or something similar over the pond, caught by the light. Wonderful pictures. They tell the story of the marsh. Mary MacADNski: Newer grasses are drying the marsh too. Can't get it just right. These are wonderful pictures and I love the bottom one. 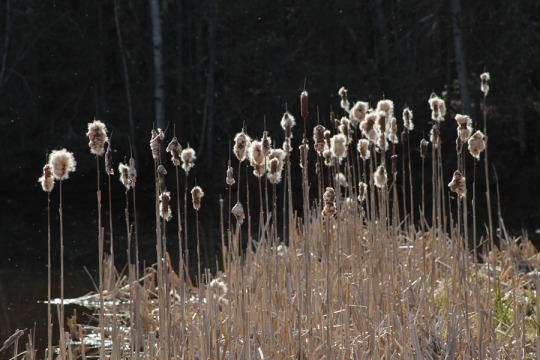 That light plays magic with the 'cigars/cattails... nature is wonderful. Mary MacADNski: I have some shots that focused on the midges. Hard to show them all, eh? Jolies photos, j'aime beaucoup la deuxième. Mary MacADNski: I took quite a few similar to the second. There is a lot happening in this picture Mary. Mary MacADNski: Yes,a spring thing. Hurrah! Nature is amazing! I love the light on the cattail fluff!! Mary MacADNski: The light was lovely that night but I shot on the bright side. Superb Mary! I love that fluffy touch. Mary MacADNski: The fluffs are so cool, soon to be replaced by food or another generation of seed. Mary MacADNski: I am glad of that, Ray but I see a few muskrat nibbles. Mary MacADNski: A pond is wonderful to study in that respect. Nature really IS wonderful, Mary, isn't she! Mary MacADNski: She is our friend and enemy at times. I love the second photo, the fluffy cattails in the sunlight. Mary MacADNski: I have several. i should have featured one of those instead of the lone wolves. Nature in action. Clever isn't she? Mary MacADNski: She is clever in many ways. Le's hope that this takes root and new life springs from it. Mary MacADNski: I hope so too. I have a grass that wants to take over. It is the last step before accretion sets in.